October is a very exuberant time in India. The monsoon rain has eased in most places, and the festival season is in full swing! Come to India in October and take part in events filled with lights, music, and dance. Here's the best of what's on in October in India (in date order). John Henry Claude Wilson / robertharding /Getty Images. When: September 23-October 24, 2018. Where: Ramnagar, on the banks of the Ganges River opposite Varanasi. Back for the fourth edition this year, the Kabir Yatra is a traveling folk music festival in Rajasthan. It will feature more than 50 artists from Kutch, Malwa, Bengal, Chennai, Mumbai, Delhi and Rajasthan who will perform music from across genres. Attendees will also be able to listen to poetry from Bhakti and Sufi saints such as Kabir, Mira, and Bulleh Shah. The festival will showcase the work of painters, sculptors and photographers inspired by this tradition as well. Where: Jodhpur, Jaisalmer and Bikaner. Navaratri is a nine night festival that celebrates the Mother Goddess or Shakti in all her manifestations, including Durga, Lakshmi and Saraswati. Worship and fasting take place in the daytime, while the nights are reserved for feasting and dancing. The festival culminates with Dussehra, the victory of good over evil, on the tenth day. In Delhi, the feature of Navaratri celebrations are the Ramlila plays that take place all over the city. The festival is celebrated as Golu, with the display of dolls, in south India. Where: All across India, but particularly in Gujarat, Mumbai, Delhi, Kolkata, Varanasi, and Mysore. The state festival of Telangana in south India, Bathukamma is a flower festival that celebrates life and the Mother Goddess during Navaratri. It's devoted to Goddess Maha Gauri, an incarnation of Goddess Durga that's considered to be the life-giver and goddess of womanhood. She's worshiped in the form of Bathukamma, a floral arrangement stacked to resemble a temple tower. Women sing old folk devotional songs and take the Bathukammas out in procession to immerse them in water on the last day. A festival of "Mind, Body and Soul", the Sacred Pushkar features a range of activities focused on mindful and inspired living. These include morning yoga, sound meditation and healing, devotional music, organic cooking, and heritage and food walks, Packages including accommodations, meals, and all activities are available. In honor of warrior Goddess Durga, beautifully handcrafted statues of Durga are installed in podiums in almost every lane of the city during this festival. People flock to the streets to view the goddess statues amid mesmerizing light shows, drumming, and aromatic food stalls. On the last day of the festival, the statues are paraded around the city before being submerged in the river. Where: Kolkata, West Bengal. Durga Puja is also widely celebrated in neighboring Odisha. An initiative of Maharana of Mewar Charitable Foundation, the World Living Heritage Festival brings together artists, experts and people passionate about heritage. It features panel discussions by heritage experts and scholars from related fields, musical and performing arts concerts, a large bazaar showcasing the best of Mewari arts and crafts, and specially designed opportunities to experience the remarkable living heritage of Mewar region. A heritage walk to Ahar is an add-on activity. Where: The City Palace, Udaipur, Rajasthan. Known as the Worship of the Horse, this unique Rajasthani festival is grandly celebrated by the Mewar royal family of Udaipur on the last day of Navaratri. It honors the special relationship between warrior and horse. See the royal horses being worshiped by the current head of the royal family, accompanied by the palace band. A highlight of the festival is the mouthwatering Rajasthani cuisine. Complement the celebration by staying at the Shiv Niwas Palace hotel or Fateh Prakash Palace hotel in the Udaipur City Palace Complex. Where: Udaipur City Palace, Rajasthan. The day after the Navaratri festival is known as Dussehra. It's widely devoted to commemorating the defeat of the demon king Ravan by Lord Ram. Huge effigies of Ravan go up in smoke all over India. However, there are other more unusual celebrations of the festival too. Some start at the beginning of Navaratri, while others kick-off on the main day of Dussehra and continue on for weeks. Not all are associated with Lord Ram and Ravan. Some are tribal and some are regal. Goddess Shakti is worshiped in various forms too. 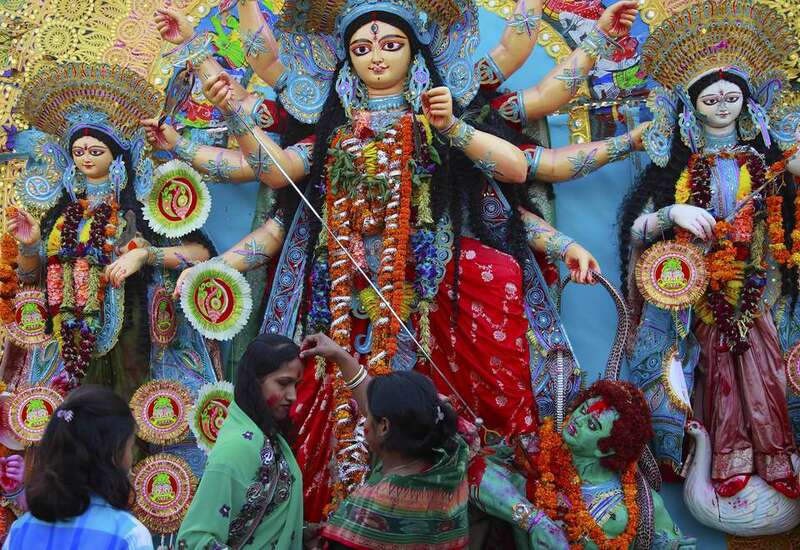 See these 9 Ways and Places to Celebrate Dussehra in India. When: Dussehra astrologically falls across two days this year, October 18 and 19. Ravan will be burned in most places in India on October 18. Where: Particularly in northern India. The remote Dzükou Valley, at the border of Nagaland and Manipur in Northeast India, will be hosting its first festival this October. The valley is home to the Angami tribe, and is known for its spectacular natural beauty and seasonal flora. Nagaland Tourism aims to showcase these attractions at the festival, along with music, dancing and food. Visitors can go on nature walks through the valley, see flowers blooming, and meet locals. At night, there will be bonfires, acoustic music and a clear starry sky. Tents and food are provided. Where: The main approach to the Dzükou Valley is via Kohima in Nagaland. You'll need to trek at the end to reach the valley. The Marwar Festival recognizes the culture of Rajasthan's Marwar region. It's held for two days over the full moon, in memory of the state's medieval heroes. The highlight of the festival is classic folk music and dance, which brings alive the myths and legends of the area. The festival also includes horse riding, horse polo -- and bizarrely -- camel tattooing. This eclectic festival, which is the first of its kind in India, showcases regional roots music and the arts. It's a heady fusion of interactive educational events, staged performances, and late night jam sessions. Performers include singers, dancers, instrumentalists and storytellers from various Rajasthani folk communities, as well as nationally and internationally recognized artists. The festival has an outstanding location in and around the imposing Mehrangarh Fort. Where: Mehrangarh Fort, Jodhpur, Rajasthan. The annual Tawang Festival is organized by the Arunachal Pradesh Tourism Department to showcase the culture of the state and promote adventure tourism. Highlights include a huge fair, chanting by the monks of Tawang Monastery, and folk and tribal dances.